Research? The implication of that can only be that the technologies available today are considered inadequate – which of course they are, for various well-known reasons. Energy Voice reports on the queue of entrepreneurs and business leaders hoping for a slice of pie-in-the-sky. Government and business leaders will pledge billions of pounds to research and develop a technical fix to the planet’s climate woes at high-stakes negotiations in Paris. 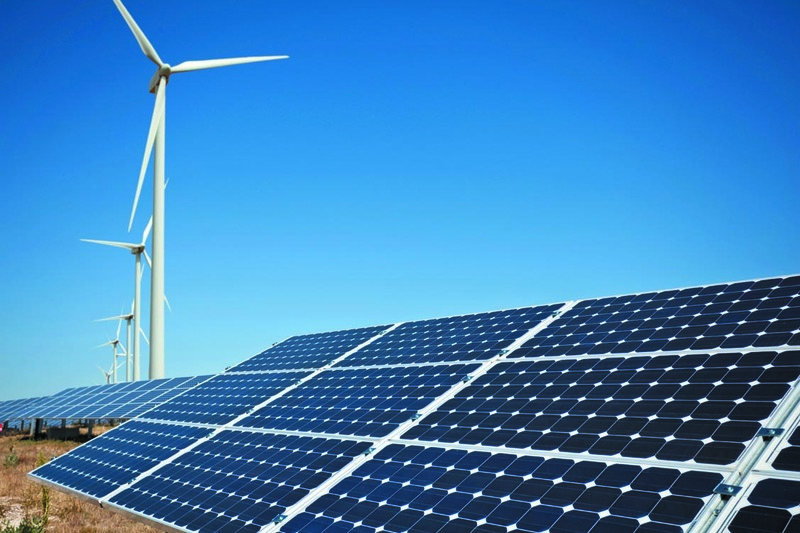 Clean energy technology is being promoted as the key to fighting global warming at the UN climate summit. 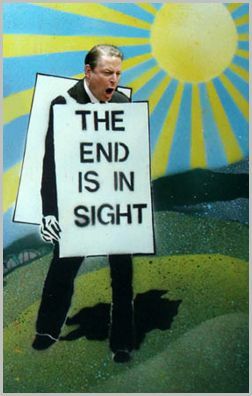 The alternative climate conference to COP21 in Paris this year is the Paris Climate Challenge, organised by Tom Harris of the International Climate Science Coalition and Philip Foster, author of several books on climate. 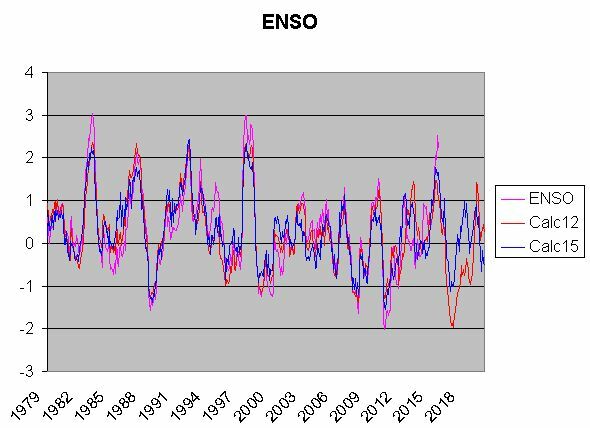 My thanks to Per Strandberg for this update on his ENSO modelling effort. This is looking good, and is based on a neural network which uses lunar and solar data for its input. 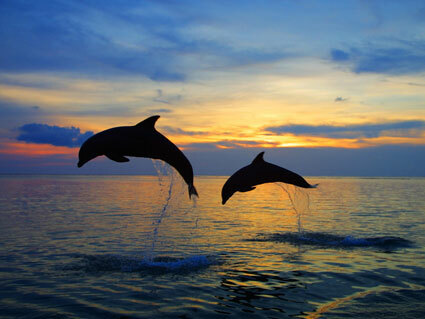 There are two main drivers of ENSO. ENSO stands for El Niño Southern oscillation and is Earth’s most influential weather phenomena after seasonal changes. When ENSO changes it causes changes in currents and of temperatures in the tropical Pacific Ocean. The most important ENSO driver is linked to variations in gravitational tidal forcing associated with Moon’s Perigee. Moon is in what is called Perigee, when the Moon is at it closest point during its elliptical orbit around Earth. This is also when the tidal force caused by the Moon is at its strongest. The second most important forcing is linked to variation in solar activity. Fig.2. Example of the drawing style in the initial period of 1825-1830.
vealed by the detailed drawings. 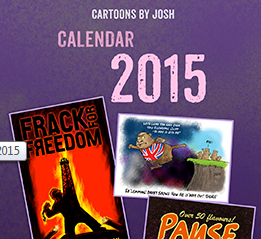 The Calendar has cartoons from the past year, mostly on Energy, Environment and Climate Change topics. This year there are also political cartoons and caricatures. Firstly: Ministers have axed the planned £1bn competition to help develop carbon capture and storage – the technology that the fossil fuel industry hoped would help it drastically cut its carbon emissions. Companies such as the oil giant Shell had hoped to secure hundreds of millions of pounds’ worth of government funding to help develop the technology, which involves trapping the carbon dioxide produced by power stations, trapping it and storing it deep underground before it can reach the atmosphere, writes Kiran Stacey. Prince Charles has pointed to the world’s failure to tackle climate change as a root cause of the civil war in Syria, terrorism and the consequent refugee crisis engulfing Europe. The heir to the British throne is due to give a keynote speech at the opening of a global climate summit in Paris next week where 118 leaders will gather to try to nail down a deal to limit rising greenhouse gas emissions. The prince said in an interview with Sky News, to be aired on Monday and recorded before the Nov. 13 attacks in Paris, that such symptoms were a “classic case of not dealing with the problem”. 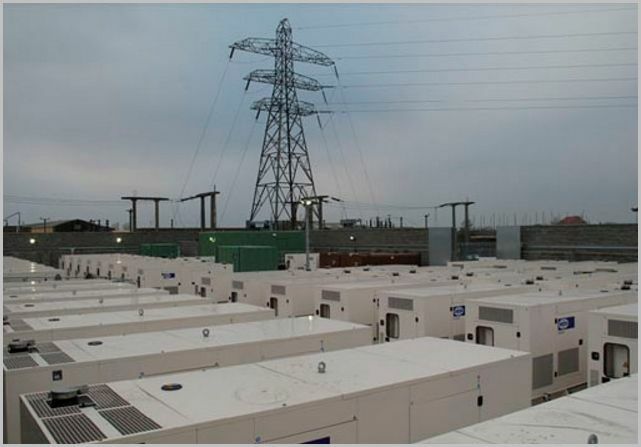 It has to be said this scheme looks very small against the massive Dinorwig set-up (1,728 MW). This type of facility can use surplus off-peak (e.g. overnight) wind power to pump the water up to the top, then send it back down by gravity at any required time to spin the turbines and generate ‘instant’ electricity. 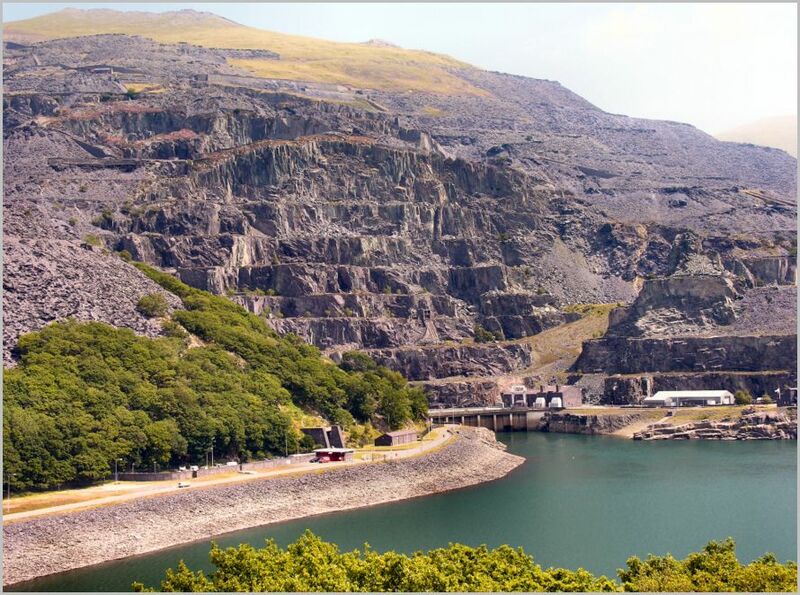 An application has been submitted to begin development on a 99.9 MW pumped hydropower storage facility in Wales, the project’s developers have announced. Solar hard UV is weakening. 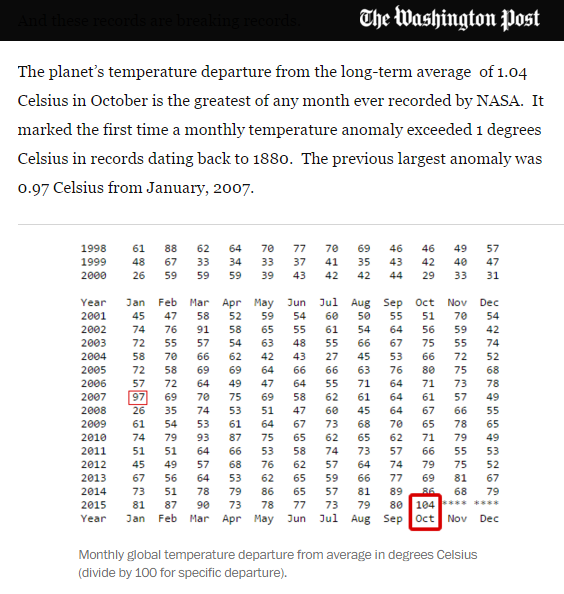 lower for the cycle 24 maximum compared to the previous one. ances to properly take the solar forcing into account. The Paris climate conference is already looking like an expensive waste of time, judging by this report. The US Senate sent a powerful and unmistakable message to UN climate delegates this week: Don’t expect any US money for Obama’s climate promises. 52 U.S. Senators voted to block an Environmental Protection Agency (EPA) rule this week that would curb carbon emissions from existing coal-fired power plants. Passing the resolution without a veto-proof vote (the President has already promised not to sign it) makes this act of defiance symbolic only. But with the Paris climate summit just a week and a half away, it’s powerful symbolism indeed. 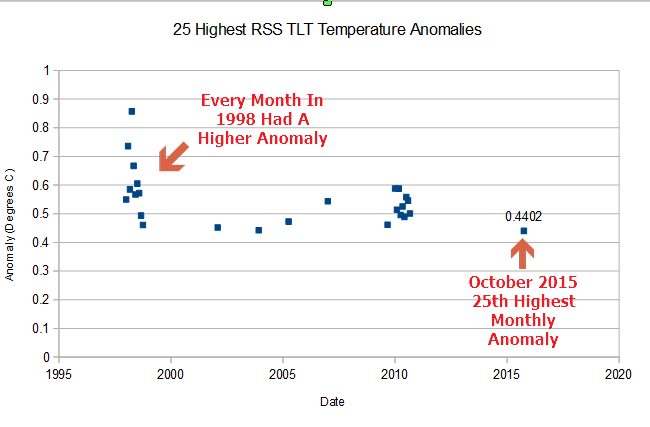 Satellites cover almost the entire planet several times a day, and they showed that October had only the 25th highest monthly anomaly, and that every month in 1998 had a higher anomaly than October 2015. Many people have wandered through the wonderland Martin created during the early years of the world wide web. 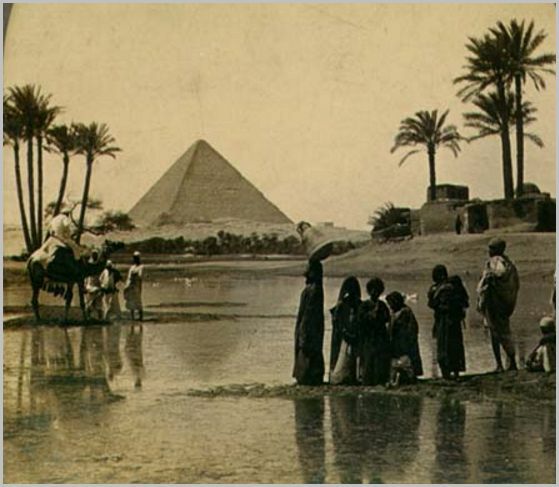 His painstaking construction of an annotated weather timeline from ancient times up to today. IMPORTANT: Some elements on this web site will continue to be maintained as long as I am able – mainly the West Moors local weather data: however, the ‘Weather in History’ section will have to be ‘frozen’ now as I can no longer access the ‘raw data’ to add-to / amend the entries. However, I’m pleased to report that the British Library have offered to archive the entire site (with the ‘Weather in History’ files embedded) and this will mean that the data will be available as long as that organisation is in being: the host web site is HERE: enter the search term ” Booty Meteorological ” into the text box to find the data.